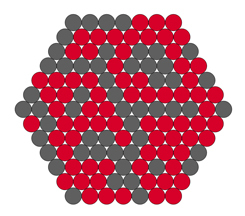 The board must be completely full of stones, and the value of the expression (number of distinct red connected groups + number of distinct grey connected groups) must be odd. Typically, you only count connected groups that are above a certain minimum size in order to determine the winner. Therefore, when you propose this pattern, you must also specify this minimum group size. To propose the pattern, say "Odd X", where X is the minimum group size. So, if you only want groups that are 7 stones or larger to figure into the final count, then say "Odd 7" to propose the pattern. This one is not for the faint of heart. Players should call out whether the current number of sufficiently large groups is even or odd at the end of each player's turn, so that they don't have to recount groups between turns. Also, although the board is full in the example below, in actual play it will become obvious who the winner will be well before the board is full, so most games will end with a resignation. Finally, don't make the minimum size too small, or else the early game is boring.